On one of the hottest days of summer, a friend and I embarked on a two-day bike trip to Perkiomenville. Every Monday, over 300 vendors gather at the corner of Route 29 and the Perkiomen Trail for what is widely considered one of the best flea markets around. We had our saddlebags ready for the 96-mile round trip, loaded with PB&Js, extra bike tire tubes and as much water as we could manage. The route to Perkiomenville is a mix of on-road, paved path and packed gravel. So, which bike to take? My companion chose a comfortable single-speed over his touring bike. I grabbed a lightweight road bike, ditching my city workhorse and its slightly fatter tires. Four and a half miles on the Schuylkill River Trail took us to Manayunk, where, based on our sleek rides, we favored Umbria Street over the gravel Towpath. At mile eight, we reached the Valley Forge Trail. Here, I let my buddy in on a favorite bicycling activity of mine: the Zoom. Coined on a trip through Sonoma, Zooming is the simple pleasure of speeding up to pass slow movers, including but not limited to tricycles, joggers, families and little kids. For maximum gratification, “Zoom” is whispered just before the act, “Zoomed” immediately after. We were so busy Zooming 10-year-olds with our skinny tires that the paved path to Valley Forge flew by. We pounded those PB&Js and refilled our water bottles at a picnic area around mile 21. 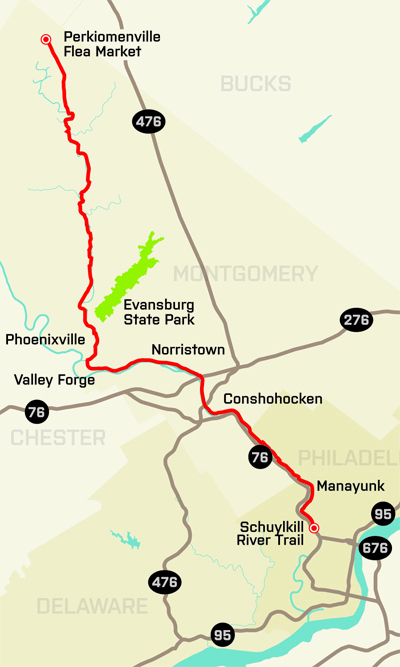 For shorter trips, the trail network beyond Valley Forge offers options to Evansburg State Park and Phoenixville. The packed-gravel Perkiomen Trail was up next. It was shaded and much cooler than the sunny Valley Forge path. Our bikes handled surprisingly well on the gravel, allowing for decent speed. We even managed the occasional Zoom. At mile 35, we spotted a sign that sent shockwaves through my tired legs: “12% Grade Ahead.” As we made our approach, I released an audible wheeze of relief—it was downhill. We sped joyously along, tucking away our climbing anxiety until tomorrow. Near the end of the Perkiomen Trail, at mile 40, we breezed by the site of the flea market. But we weren’t quite done—we still had eight miles along Route 29 to reach the Globe Inn and its glorious A/C. (There is camping near the market, but we’re soft.) We tackled the final three hills in silent, sweaty despair. The Globe opened in 1895, and has operated on the same corner in East Greenville ever since. We ate pizza around the corner and caught a movie at the Grand, a recently restored one-screen theater. We drank some water. Then we drank some more water. After a good night’s sleep, we hit the flea market. Row after row of dealers offered antiques, furniture and collectibles. Unfortunately, our saddlebags couldn’t handle the 1950s card catalogue or the 10-pound wire mesh seltzer bottle, but we still managed to accrue plenty of small trinkets, including a tiny silver perfume bottle once owned by a “Lynne Elkins”—the name was engraved along the face. Our legs were a little stiff when we got back on the Perki trail. Once we hit Salford, I noticed a father and son duo hot on our tail; the son looked to be about seven years old. But I only had one thing on my mind: getting up that 12 percent grade. Thank goodness we resisted the seltzer bottle. We built up some solid momentum at the base of the ascent, switching gears, spinning in the gravel. I was breathing hard, trying to push through the burn, when I noticed two voices getting progressively louder. Wait. Were the father and son going to Zoom us on a 12 percent grade? In an incredible blow to our egos—and as karmic retribution for all the 10-year-olds we gleefully passed the previous day—we were Zoomed so badly it was almost a Zing. At the top of the hill (reached on foot; we had to get off and walk our stupid skinny tires), we couldn’t even look each other in the eye. Zing Zang Zung by the father and son. Our comeuppance, as oppressive as the July humidity, was palpable all the way home.